The British Gazette » I’d like to wash that SSBN right out of the Fal! Above is the smiling face of Mr Rob Simmons. Mr Simmons looks like a pleasant fellow and he is. 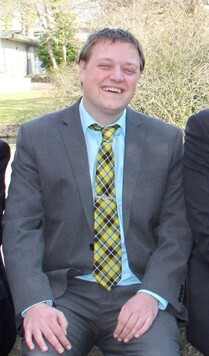 Mr Simmons is the candidate for Mebyon Kernow (the Party for Cornwall) for the St. Ives and the Isles of Scilly. Mebyon Kernow could be described as the Cornish National Party, but that would be unfair as they are a pleasant group of local folk and VERY different in both character and temperament than SOME of the activists of the Seriously Nasty Party – AKA the SNP. The other aspect of course is that Mebyon Kernow are not campaigning for independence. From a look on their website you will see that they are a centre left party who are happy with the UK being governed by the EU. The other aspect to note is that they have been completely taken in and hoodwinked by the Glow-Bull-Warnists. Mr Simmons is wandering under the the mistaken belief that 401.52 ppm atmospheric CO2 is a problem when of course it is not! The reason for paraphrasing of one of the songs from the musical South Pacific is that Mr Simmons is going to find himself in a bit of a quandary in the not too far distant future. Having failed to be elected to Parliament, he will find himself presented with two developments. One of these is going to make him angry. The other is going to make him happy. The development that will make him angry is the basing of the Trident submarines and their nuclear missiles in and around Falmouth. This will be brought about by an Act of Parliament that will bypass the entire planning process. Owners will have their land compulsorily purchased – they will gain financially from this – and local politicians and people will have absolutely no say in the matter. Mr Simmons and his colleagues are going to become very annoyed. As will many others living in Cornwall. The government will however be offering an ointment to sooth the pain of this democratic bypass: A Cornish Assembly. This will be in effect a renaming of Cornwall County Council and legislation giving it more powers. It will also receive a LOT more money! In fact, we will be able to call Cornwall the Scotland of the South West. This is of course EXACTLY what Mr Simmons and his colleagues want! This of course will not stop thousands upon thousands of woolly jumper types and the “rent-a-Trots” from converging on the Fal estuary from across Europe. This of course will be GOOD NEWS for the local B&B industry and the local retailers. It will however be very BAD NEWS for anyone unfortunate enough to be driving along the A39 betwixt Falmouth and Truro! All of this will mean more jobs and more money for Cornwall. Some Readers will know that your Editor (now resident in Cornwall) has had a bit of a tough time of it of late. Well, happy days are here again!